Brooklyn had helped to supply the industrial needs of the country, but by the 1950s, Brooklyn's industrial energies began to wane. Heavy manufacturers began to move to cheaper locations in other cities, and the ports became less active as large container ships, requiring deep harbors, began to dominate the shipping trade. Economic dislocation and the easy availability of government-sponsored housing loans spurred the middle classes to leave their old neighborhoods for the suburbs. Hundreds of thousands of white middle class residents abandoned Brooklyn for Queens, Long Island's Nassau County, Staten Island, and New Jersey. Whole Jewish communities fled their old neighborhoods and moved to Flatbush, Borough Park, Eastern Parkway, and Brighton Beach. Many Italian families moved to Bensonhurt and Gravesend. Finally, in 1957, Brooklyn's pride was dealt a harsh blow by one particular departure: the Dodgers moved to Los Angeles. The Dodgers were as much a symbol of Brooklyn as the Brooklyn Bridge -- and just as permanent, or so it seemed. The Dodgers games at Ebbets Field drew people together, and provided a point of commonality for the borough's diverse population. The Dodgers seemed to offer something for everyone. In 1947, Jackie Robinson had joined the team, becoming the first African-American player in the major leagues. When the Dodgers defeated the New York Yankees in the 1955 World Series, many loyal fans felt that they could finally hold their heads up proudly. 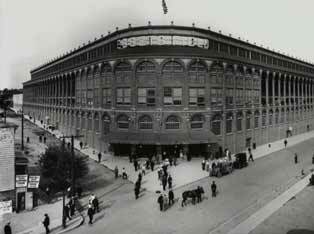 When the team abruptly voted to abandon the borough and become the Los Angeles Dodgers, it was widely viewed as yet another sign that Brooklyn's golden age had come to an end. Once-vibrant neighborhoods fell into disrepair, decay, and poverty. 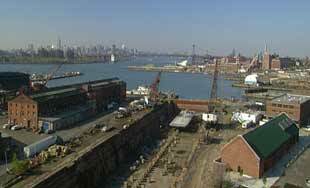 Manufacturing fell by one half between 1954 and 1990, and the Brooklyn dockyards were largely abandoned. Even the Brooklyn Navy Yard closed in 1966. The blackout of 1977, a decade later, became one of Brooklyn's worst moments: The power failure led to widespread rioting, looting, and arson; entire sections of now predominantly black neighborhoods went up in flames. Several blocks of the main Broadway shopping district in Bushwick were torched, with devastating effects. One-third of the remaining stores closed immediately, and more than 40% of Bushwick's commercial and retail operations went out of business within a year. Despite the turmoil of the 1970s and early 1980s, the final decade of the 20th century witnessed a revival in Brooklyn's fortunes. 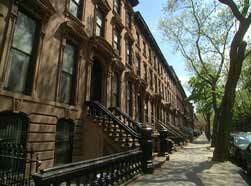 Crime ebbed during the 1990s, and neighborhoods like Brooklyn Heights, Fort Greene, and Clinton Hill began to spring back to life. The Brooklyn Academy of Music began to draw avant-garde crowds from Manhattan, the Navy Yard began redevelopment into a booming industrial park, and a new generation of artists, fleeing from the high rents in Manhattan, created vibrant new communities in DUMBO (Down Under the Manhattan Bridge Overpass), Williamsburg, and Greenpoint. And, of course, new waves of immigrants continued to make the borough their home, lending new accents, flavors, and textures to old Brooklyn neighborhoods. Today, Brooklyn is called home by thriving immigrant communities from the Caribbean, Latin America, the former Soviet Union, the Middle East, China, and Korea. As always, Brooklyn continues to draw its residents and spirit from across the globe.